partyboss This pinata was larger than I expected it to be. It holds a lot of stuff! The pull strings worked great. When my 2 year old pulled the string that opened the pinata he was so excited. We now have it hanging in his room because it is still in really good shape. TDYEarth I bought this for a school classroom party. Dr Seuss isn't the theme for this particular party but I needed an extra large one to accomodate 20 children. I have loved the pull string idea in the past, this is the first one I have purchased with it already installed - an added bonus in my opinion. It is another reason why I selected this pinata. Very well made. AAApril This pinata is a lot smaller than I thought and the picture of the hat has a smudge on it. If it wasn't such a hassle to ship it back, I would. LogansMommy2 This pinata is a lot smaller than I thought and the picture of the hat has a smudge on it. If it wasn't such a hassle to ship it back, I would. Leliat This was for my youngest son's 2nd birthday party which was Dr. Seuss themed and he loved it. When it came he yelled "HAT!HAT!" when he saw it. It was well made and the kids had a blast. maxa The kids had soo much fun with this pinata! I was worried that the strings wouldn't work, but they did and it was so cute to see their faces when they pulled the wrong string! 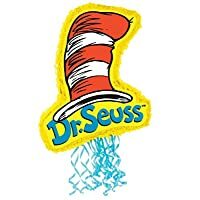 :) I HIGHLY recommend this for anyone doing a Dr. Seuss theme. Reasonable price, it was delievered 2 days before the estimated date and the kids loved it! Can't ask for anything more. BARGINMOM i BOUGHT THIS FOR MY SONS BIRTHDAY, I ACTUALLY ORDERED THIS MONTHS AHEAD OF TIME, JUST INCASE SHOPPING WAS SLOW OR SOMETHING HAPPENED TO MY ORDER....HOWEVER I WAS VERY PLEASED THAT FOR ONE MY ORDER WAS AT MY FRONT DOOR WITHIN JUST A FEW DAYS AND THE PINATA TO MY SURPRIES WAS VERY BIG AND TRUE TO SIZE! WE LOVE IT ANDCANT WAIT TO USE IT THANKS SO MYCH!! 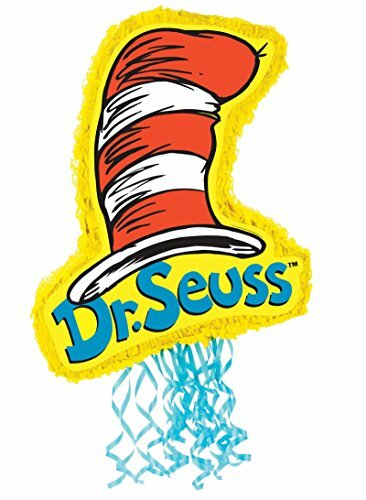 IamMsMom I got the Dr Seuss pinata for my 2 year old's birthday party. It was perfect except that it began to break apart. We taped it together with duck tape, and it held together. My 2 year old loves the cat in the hat. That was why I got the Dr Seuss pinata. My 2 year old loved it. Includes pinata. Does not include fillers or favors. This product is officially licensed by Dr. Seuss Properties, Dr. Seuss Enterprises, L.P. All Rights Reserved.